Caroline Hughes with Luke and her partner, Steve Riley. The pair dressed as carrots to raise money for a Nystagmus charity. Have you ever failed to follow an object as it passes you by, needed to strain your neck and back in order to focus, or felt as if the ground was moving beneath your feet? 18-month-old Luke Riley, from Lincoln, tackles disabling sight problems every day, and is learning to cope with a condition that leaves him a little “wobbly”. Luke’s condition, called Nystagmus, is an involuntary movement of the eyes which often seriously reduces vision. Many sufferers encounter difficulties in every-day life, education and employment. Although Nystagmus affects at least 1 in 1000 people, awareness of the condition is low. The Nystagmus Network (NN) is a UK charity, providing information and research on the condition. On Wednesday November 6, NN will launch their first International Nystagmus Awareness Day, Wobbly Wednesday, and Luke’s mum Caroline Hughes is especially keen to encourage people to get involved. “At first I never knew anything was wrong,” explained Caroline “We had noticed his eyes wobbling but always thought it was a newborn thing. Luke was later diagnosed in February 2013, after being referred to Lincoln County Hospital. Currently Luke’s eyesight is developing well but the effects are not fully obvious yet, says Caroline. “Luke also has what is called a Null Point, which is where he has optimum vision and the wobble is at a minimum. “For Luke, his Null Point is a chin depression where he lowers his chin to his chest. Some tilt their heads to the side. Caroline and members of the network have been raising funds throughout the year and, with the help of friends and family, have managed to raise £3,000 since Luke was diagnosed. Among recent sponsored events, Caroline and a group of night walkers dressed as carrots completed a Nystagmus Network event in September. 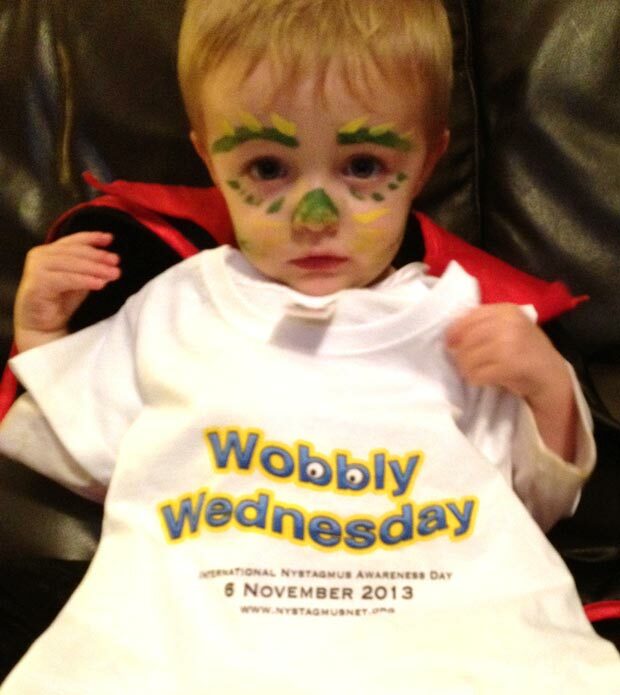 Wobbly Wednesday is the first ever international awareness day, with the American Nystagmus Network also taking part. Organisers are encouraging people to raise funds and awareness any way they would like to. “It breaks my heart that I am the only person doing something for Wobbly Wednesday, apart from our nursery. I don’t believe that Luke is the only person in Lincolnshire that is affected by Nystagmus,” added Caroline.